So there I was on a Thursday evening. It was about 10:30 at night, and I was all set to play some Pocky & Rocky with Becky! I had my delicious raspberry-vanilla soda at my side and a firm resolve in my heart to take on the franchise (known as the Kiki KaiKai series in Japan) for which I have much affection. The earlier North American releases, Pocky & Rocky and Pocky & Rocky 2 on the SNES, were fun little romps through Japanese culture, whapping ghosts with a magical wand and tossing leaves with the might of an anthropomorphized tanuki. I had somewhat high expectations of this sequel, even though it had been seven years since the last instalment, and the original developer wasn't involved in its creation, aside from publishing rights in North America. Instead, this was developed by Altron, who also brought us... uhhh, errr... Cleopatra Fortune? The Game Boy Advance port of The Simpsons: Road Rage? Some silly game about the Jonas Brothers for the DS? By the end of my journey through Pocky & Rocky with Becky, both my soda and my spirit were completely drained. From the get-go, you have to select between Pocky, Rocky, and Becky to Linguists rejoice: the suffix "-cky" will not fade from the English language any time soon thanks to this game. All three have the same basic attack of just shooting forward (though Rocky fired off leaves instead of magic cards). Pocky and Becky are practically similar, although in their most powered-up forms, Pocky can throw explosive cards, while Becky's more of a multi-directional shot kind of gal. Rocky can shoot additional homing bullets, although they have a strong tendency to just fly off in the wrong direction before eventually swinging back. Most stages are brief and somewhat tolerable, despite having a terribly short health meter for this type of game. You're basically trying to get from Point A to Point B, shooting the living daylights out of slews of ethereal marshmallows, flappy sentient kites, and cherry umbrellas with a death wish. Sometimes you'll even get a few bullets thrown your way (or three, if those nasty kites have anything to say about it). Yet aside from a few moments of severe tension involving too many enemies and flying bulletry on screen, the actual adventuring isn't much of a challenge. Frankly, you can just wave your wand through and shoo off 90% of the enemies without even flinching. You'll need to do a little hunting to find a key to unlock the boss room, but even this is very simple, considering how cramped the areas are as a whole. I wish that the cameraman didn't occasionally take a nap, though, as transitions to new "areas" of the level are jagged, rather than smooth. 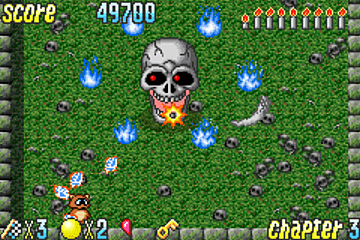 Along the way, you can pick up various items that will either increase your fire power or give you extra special attacks that wipe out everything on the screen. And for some reason, if you find the right item, some random robot will come and help you defeat every enemy in your path. I don't know who it is or what it is, but I'm more than happy to enjoy its company because I can just wander around, not being too concerned about my own well-being. Sure is grassy, isn't it? The real meat and scalloped potatoes of Pocky & Rocky with Becky is in the boss battles. After all, you may very well end up spending the majority of your time here. Things started out reasonably enough. The first chapter boss, "CrowTengu" (yes, without a space), is pretty simplistic, offering a mixture of tossing blue whirls and dashing at you from the top of the screen. But later bosses require a much longer time investment to slowly whittle down their already excruciatingly lengthy health meter. I'm especially referring to the Chapter 6 boss, whose drinking prowess is apparently quite high and is prone to dozing off mid-battle when he's not shooting lasers or pitching snifters of blue curaçao. Playing as a maxed-out Rocky (complete with a degree of homing fire) was absolutely brutal and shot my anxiety level through the roof. How do you compete with a guy who can fall asleep at any given moment and revive his health meter as much, if not more, than the amount you just lopped off? It may have helped if I could have used my character's special attack, but for some bizarre reason, Altron opted to lock your ability to use this during boss battles. And here I was, saving them up for a special occasion before someone chose to make an asinine design decision. Playing as Pocky makes this fight IMPRESSIVELY easier, although she had a far more difficult time with the previous boss, thus making no character any more useful than another. Plus, they just have the most uncreative names you could imagine. "Smart Boy"? "Snow Woman"? "Giant Spider"? ...and the final boss, which is normally credited as the Evil Hydra, is only referred to as "Giant Snake" in the game. Great localization, folks. Definitely a 10/10. I'm surprised you didn't call this game "Two Girls & Animal". Then again, the dialogue isn't much better. Every boss has something to say before and after each fight, and if you miss it, good riddance. "Welcome... But this place will be your grave." I was looking to get cremated. "Ha ha ha ha ha! Can you drink?" Well, I do enjoy a good glass of orange juice... "I'll eat everything this time." There's a reason why 1-800-94-JENNY exists. If you lose all your lives, fear not — there's a password system in place. And they're not particularly long, although they sure could've simplified it a bit. Why are there so many different possible characters to use? Letters, numbers, card suits, musical notes... THERE'S A MUSICAL NOTE IN MY PASSWORD. Get that out of there! Altron REALLY didn't want anyone to easily just put in random letters and sneak past a stage! 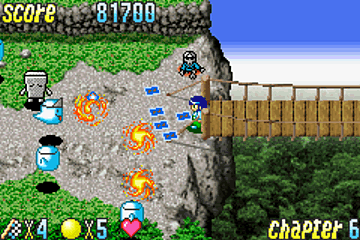 For an early Game Boy Advance title, Pocky & Rocky with Becky doesn't hurt the eyes much, but too many of the areas look the same: dried gray stone paths and grassy surroundings. Only Chapter 4, set where a blustery winter snowfall has just occurred, breaks the chain, but then again, who wants to see a background of mostly white? Also, the character design could've used a bit more polish. Okay, a LOT more polish. Becky is just a palette swap of Pocky, and Rocky, despite looking his usual stout self, seems far too slim in his up-close shots. Maybe that 1-800-94-JENNY ad really worked on him, and that's where he's been since Pocky & Rocky 2 dropped back in 1994. And as for the music, I forgot it was even playing... WHILE it was playing. 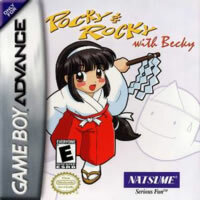 Earlier Pocky & Rocky games had a cute charm to them, and although Pocky & Rocky with Becky tries to reclaim and revive that mystical spirit, it falls very flat with dry gameplay, little presentation charm, a lack of player drive for replay, and just a cumbersome name that rolls off the tongue like a drunken sailor rolls off a bar stool. It's rather difficult at times, perhaps due to some questionable design choices, but this actually reflects its arcade roots, which was less forgiving than the SNES counterparts. But this is no arcade game, no quarter-gobbler, and leniency would be much appreciated. I will advise you to seek out the SNES pair of Pocky & Rocky games and avoid this one. Sorry, Becky.